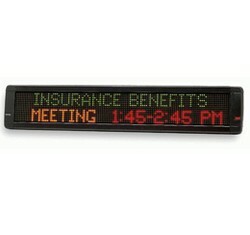 The Edwards MC2 Series of Message Centers are indoor rated multi-color LED communication centers. They may be used as a single stand-alone message center or can be networked into a company wide communication system. When networked, one message can be transmitted from the controlling computer software to the serial computer interface on all the message centers within the facility or discrete messages can be sent to specific addresses within the communication network of messages centers. The units may be wall or ceiling mounted using the supplied hardware. Designed for commercial and industrial indoor communication, Edwards Message Centers can display production goals and performance, safety goals and performance, changes in employee benefits, company announcements and achievements as well as boost morale through employee recognition. May be used in commercial establishments from stores to restaurants to assist with internal and external communicatons.